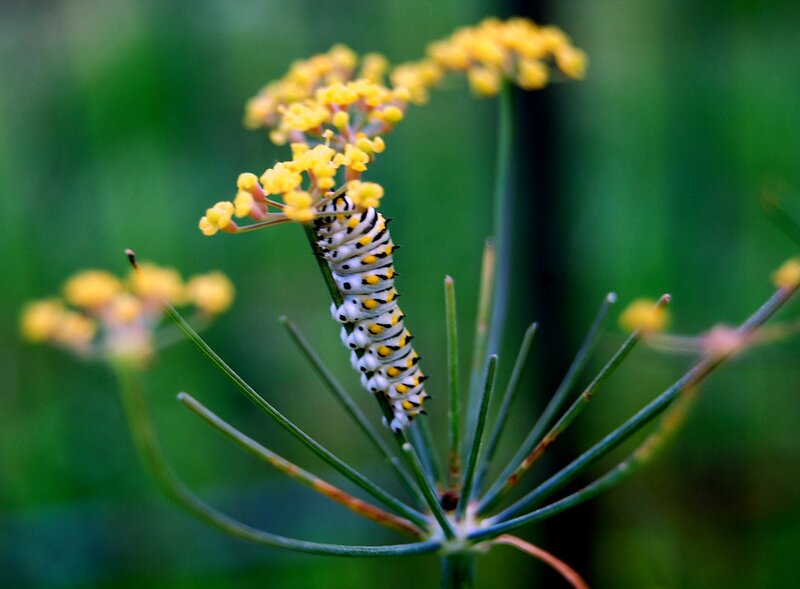 A black swallowtail butterfly caterpillar chews on the bronze fennel in my garden. 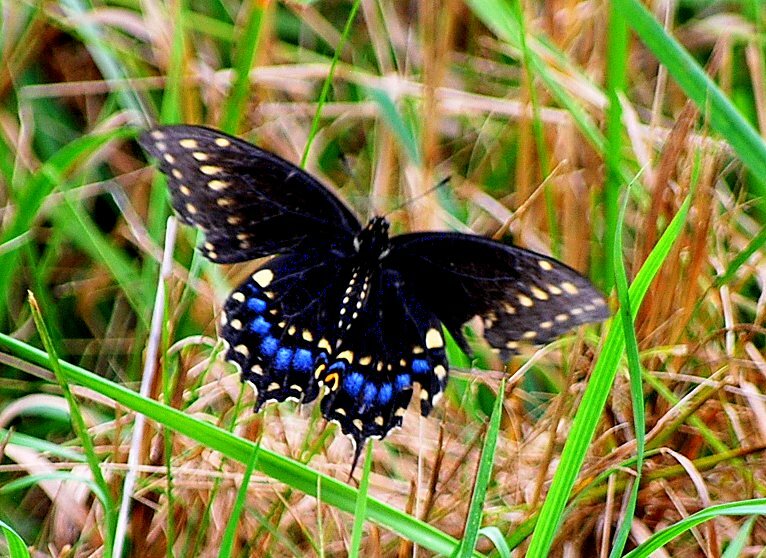 I’ve been chasing butterflies with my camera — actually, there was just one black swallowtail butterfly. I saw the first one of the season today, and it’s September 5. What happened to the rest? I’ve seen one monarch, a handful of yellows and possible even a zebra butterfly. I spotted dozens more last year in the neighborhood by this time. Why does this matter? Butterflies are among that essential group of animals called pollinators, necessary to transfer pollen to fertilize nearly 80 percent of our food crops. Some, like bees, are disappearing at a rapid rate. Without pollinators, there wouldn’t be much to eat. I’ve planted enough flowers for a 24-course butterfly banquet. 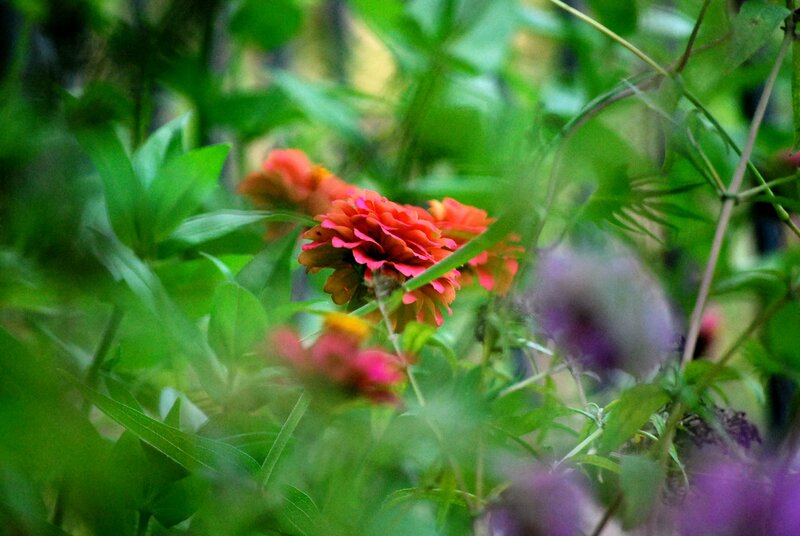 I’ve got butterfly bush, butterfly weed, stonecrop, coneflowers of all kinds, asters, zinnias, phlox…….yum, yum. When I finally spotted a black swallowtail today, he or she flitted about the weed-whacked vegetation on the golf course — no nectar flowers there. While just on my side of the fence, I had the Country Buffet awaiting….What’s the deal? This is the first black swallowtail butterfly I've seen this year. I couldn't get it to pose on a flower. I did follow the progress of about two dozen black swallowtail caterpillars on my bronze fennel (a member of the parsley family) throughout the summer — evidence that butterflies did flutter in and lay eggs, probably while I was sitting at my computer complaining online to fellow “butterfly nerd” friends that there weren’t any butterflies. I’m heading soon to the Pollination Garden open house at the University of Kansas. I’ll find out what’s going on with butterflies this year and let you know. To learn more, go to the links to Pollinator Partnership and Monarch Watch on my blogroll. If you were a butterfly, could you pass this up these flowers? Delicious! Today, I rescued a black swallowtail butterfly that got attacked by a crow. He was not injured except for missing part of its wings and can still fly. Truthfully it takes a lot of work to actually play host to creating the correct environment that would enable a butterfly to go to chrysalis and subsequently hatch. I (we) just let nature happen not to mention the fact that we are obviously doing our part to maintain a good habitat for them. I raise Black Swallowtails in MO. It’s fun… good luck. Hi, nice pics of the swallowtail. The great thing about planting flowers for butterflies is that we humans get to enjoy them too. I personally like the smell of lavender. I recently read that lavender attracts the black swallowtail! Thanks for treating us to the great pics. I am also a butterfly nerd. (there are worse things we could be) I have been raising monarchs succesfully since I was about 5 yrs. old. 40+ yrs. They will not devour anyones garden. They only eat milkweed or butterfly plant “glorified milkweed” This summer I released about 150 of them raised in two 10 gal. aquariums. and a few glass jars. I have 29 left to go and 4 hatching in the a.m. I have been taking pics. like a nut but I have so many great shots! I can help if anyone wants instructions for next summer. Right now though I have an aquarium with 10 parsley eating black swallowtails if you have any advice I am going on memmory from the few swallowtails I raised when very young and I would like to add Zebras & Tigers to the lot but have not seen them and don’t understand the whole deal on the nextar thing and the identification etc? Any pointers?